Prince Zeid Ra'ad Al Hussein, Hina Jilani and Bill Swing. European leaders must demonstrate political courage and treat their electorates with honesty and respect to effectively manage the current refugee crisis, The Elders said at a debate in Geneva. The movement of refugees and migrants is driven by complex and diverse factors but political clarity, courage and ethical leadership is vital to ensure social stability and respect for human rights. He added that political leaders across Europe should adopt this approach rather than pandering to xenophobic and populist parties of the far-right. Prime Minister Brundtland discussing Nordic social values. Gro Harlem Brundtland, Deputy Chair of The Elders, cited the experience of her own country Norway, which has a generous tradition of receiving refugees which is supported by the broad majority of the population. This tolerance is due in part to the long-established Nordic social values of egalitarianism and solidarity, but also because politicians have explained why compassion is necessary, making it easier to find social consensus to provide the necessary resources. “Too many leaders are not only shy when it comes to making this case to their people, they fundamentally lack the courage to do so…” Gro Harlem Brundtland warned. 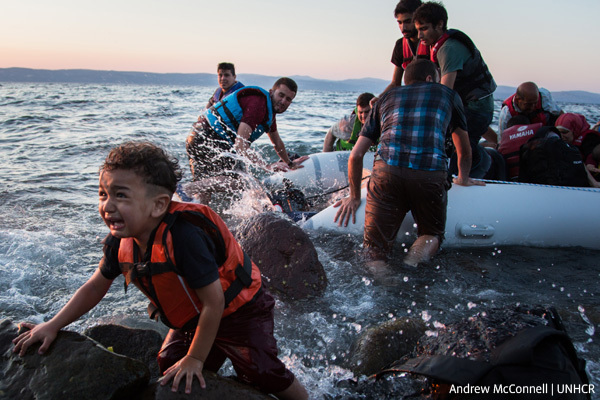 The war in Syria is one of the acute drivers of the current refugee crisis in Europe. Kofi Annan expressed some optimism that current talks between the United States and Russia might lead to a political breakthrough that could help end the conflict. "In this situation the role of Russia and the US are key. The big powers working together with regional powers, Saudi Arabia, Turkey, Iran, Egypt, Qatar should try to come up with a common framework to resolve the issue" he said. A recurring point in the debate was the need to establish secure legal channels of migration to reduce the vulnerability of people to smugglers, criminal gangs and situations where their human rights could be abused. Elder Hina Jilani on the situation in Pakistan. 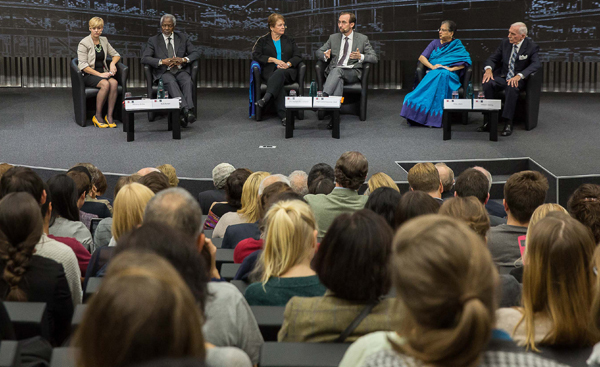 Hina Jilani argued that in her country of Pakistan, millions of people wish to move abroad because of the “low-intensity conflict” of the past decade and the natural aspiration to seek a better life for themselves and their families. Even if they are not strictly classified as political refugees, they should also be seen as “forced migrants” because of factors beyond their control like terrorism, heavy-handed counter-terror operations, growing sectarian tensions and poor prospects for economic growth. Prince Zeid on the power of language. This point was elaborated on by Prince Zeid who stressed that however they are classified, refugees and migrants are all entitled to the same human rights as anyone else. He urged politicians to move away from toxic talk of “swarms” and “hordes” of migrants, that dehumanises individuals and can enable violent extremists to feel they have a licence to physically attack incomers. “Disgraceful, avoidable human suffering is being generated… If we don’t accept this is a collective responsibility, we strip ourselves of our collective conscience,” Prince Zeid told the audience at the Graduate Institute. Bill Swing on migration trends. Giving an overview of current migration trends, Bill Swing described an “unprecedented era” of movement that reflects unprecedented population growth, humanitarian disasters, conflicts and climate change but also developments in technology and globalisation which contribute to migration. Unfortunately, this had so far led to “systemic paralysis” on the part of the international community and particularly Europe, which is still trying to psychologically adjust to being a point of arrival for migrants, not a point of departure as in previous centuries. “You cannot solve a demographic deficit with a compassion deficit,” he said, noting that these trends will continue and increase in the years ahead.